We spent part of the long Memorial Day weekend with my parents, who live about an hour from us. They also live very close to my brother and his family, including Ryan and Riley’s three cousins on this side of the family. It was a wonderful weekend. Ryan was more engaged with his cousins than we had ever seen him. They played group games of Wiffle ball and lacrosse, unprompted by any of the adults. We didn’t have to encourage him to come join them as we have on previous visits. There were other signs of change, too. For the first time that either of us could remember, Ryan did not bring a laptop with us. He used to insist on having one whenever we left the house so that he could type hockey stats if he felt like it. Ryan wasn’t completely disconnected — he still had an iPad and his phone on which to follow the ongoing Stanley Cup Playoffs and post photos to Instagram, it’s just that he decided he didn’t feel the need to type anything. 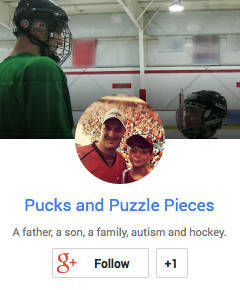 As we were getting ready to leave early Sunday morning to get home in time for Ryan’s hockey game, the subject of the changes in Ryan’s behavior came up. On the subject of typing stats, my father brought up another reminder of this behavior. Before he typed stats, Ryan used to write them out by hand, in pencil. He writes with heavy pressure on the pencil, something that was a point of contention in the past. Our dining room table contains the scars of years of kids’ homework and hockey stats. So does our coffee table. An archeologist could have a field day doing pencil rubbings on the surface of either. It turns out that, despite our efforts to prevent the same thing from happening at my parents’ house, there are visible pencil marks on their kitchen table. My dad mentioned how he notices them every now and then. Veronica remarked that she had seen them the day before and even admitted to strategically moving a place mat to conceal them. 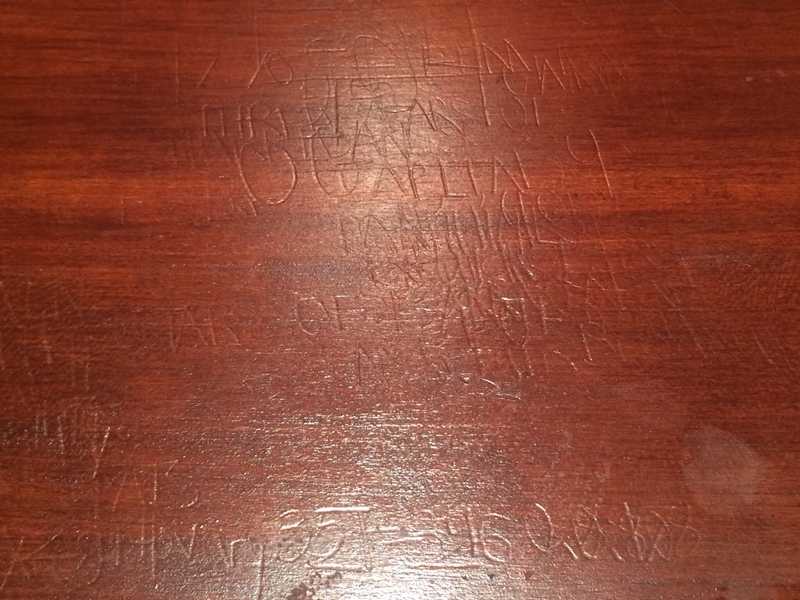 My dad said they had looked into having the table, an antique, resurfaced, but my mother said she actually preferred it this way — that Ryan’s writings had added a record of an important family memory to a family heirloom. After the discussion I went and looked for myself. Sure enough, they were clearly visible on one side of the table — the shallow imprints of Ryan’s block-ish, all caps printing. I saw the names of NHL teams. I made out one player’s name — former Devils goalie Martin Brodeur. I took a picture. While I wish he hadn’t permanently marked their furniture, there was part of me that was glad Ryan left this historical imprint of his former activities. They are a record of a time in his life when he engaged in certain behaviors that allowed him to feel comfortable when we were out of the house. They were akin to carving one’s name in a tree in the yard (not that I ever, ahem, did that), except unintentional. Just another sign, as it turns out, of Ryan leaving his mark on the world around him.